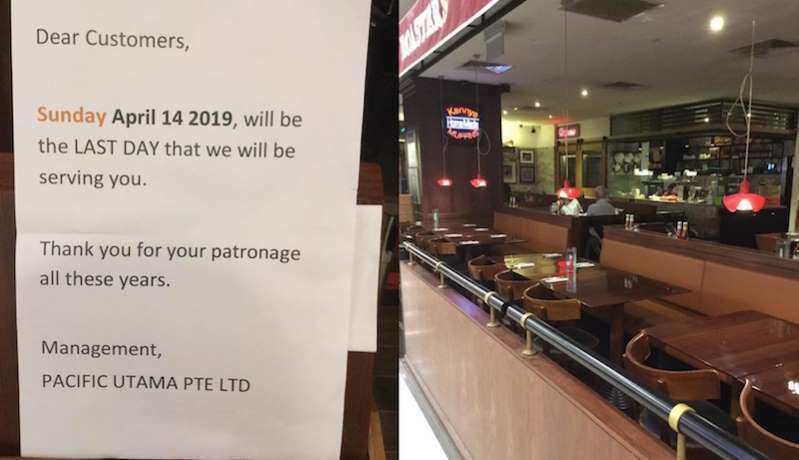 In a notice at the outlet, the management Pacific Utama thanked customers for their “patronage all these years” and notified them of the impending closure. No confirmation yet if the brand is permanently leaving Singapore, but with the Suntec City and Novena ones already gone, it seems the future could be dire for country music star Kenny Roger’s restaurant.In the online sphere, netizens have been lamenting the exit of yet another nostalgic spot, so perhaps the venue could see a spike in customers just before it closes this Sunday. can always go msia to eat. Used to be my favourite eatery, love eating the quarter chicken plus two side dish almost every weekend. But dont know since when i seldom patronise Kenny Rogers long ago liao. Yup... same same. Over the years their standard dropped. The muffins feels like overnight bread and the chicken is something like current IKEA's chicken wing, salty outside tasteless inside. Agreed, almost forgotten why i stop patronise them, now then i remember their standard indeed dropped a lot. Their chicken no longer taste tender and chicken not much meat de, also their muffins taste hard. Lol. Yes. Standard dropped like a ton of stones. Used to always order an extra plate of piping hot, moist corn muffins but over the years, they tasted dry and heated up from frozen dough. Chix became just normal common fare, the seasoning changed. Worse, prices went thru most roofs. The last time I ate there was at the century square outlet before the renovations. The ribs tasted as if it had been cooked a while already and then heated up and glazed when we ordered. That's why it was kind of dry. ya the last time i ate it was close to 10years ago and it tasted like crap. a huge drop in quality vs the 1990s when it opened. I haven't had it in Singapore since the 2000s when it was still at suntec. Ate at the Malaysia one at puteri Harbour beside the Thomas town last year. It was pretty good in the 90s. Went with my parents several times when it first opened. Not forgetting all the food delivery even from coffeeshops. Nothing new to captivate the stomach of Singaporeans. So out they go. Go Malaysia to eat lor. Better just ride horse back home with this kind of food. Only been to Kenny Rogers twice in my life. Once at Novena and the other at Parkway Parade. Wanna give them a last shot at making my money but i reckon it will be crowded. Judging from the comments here and Facebook comments.. Many said standard dropped a lot. So I guess it is not by chance that one by one close down and now last one also going to exit on April 14. I think this is an important lesson for those who is doing business that gather correct feedback is very important. Not only that, must also act on it and improve if feedback is of negative. If not slowly the business will slow down, not because of economy no good, not because of location and etc.. But because of like for Kenny Roger case is food standard had dropped a lot. Edited by Yewheng, 09 April 2019 - 09:58 PM. kind of a pity because the food menu and choices are not bad. The sides are quite good and use to be quite big portion in the past. Go try Arnold’s or Chicaboo for fried chicken. I worked part-time at the latter. The corn muffin are baked fresh every hour, I worked in the kitchen. Edited by Fcw75, 10 April 2019 - 01:44 AM. Texas is OK. Quite consistent. But most of their gimmicky flavours r not as nice due to the sauce.